There is something about books They are inanimate, yet so full of life – at times much better company than humans. If you grew up reading books, befriending them and loving them, you’re bound to have been much happier than most others. A good book can help you sail through the roughest of seas, one page at a time. Tucked away in a quiet corner of the Raghuvanshi Mills compound in Lower Parel, Trilogy is a true delight for every bibliophile. Upon entering the compound, one is greeted by a series of high-end interior design studios, making it a seemingly unlikely place for a bookstore. However if you ask around a few times for the Mercedes Benz service center, you’ll find an unassuming flight of stairs leading up to this magical haven. In the times of grand sales on Amazon and Flipkart and a rather insipid device called the Kindle, the smell of a bookstore still manages to charm many readers. Of course, we prefer that some of our favourite books were not quite so heavy on our pockets. Trilogy is a beautiful bookstore-library that provides one with easy access to numerous genres of paperbacks, hard-covers, coffee table books, art manuals, comics, photo-books etc. The front area serves as the bookstore with shelves full of neatly arranged books for sale. Towards the back is the larger library collection, filed under various genres and sub-genres. Pastel coloured post-its with catchphrases guide you through the shelves. In the middle, a long wooden table with chairs around it makes for a comfortable space to plonk yourself down for a leisurely afternoon with your book. A couple of speakers play some mellow jazz music as the large windows filter in the right amount of sunshine to light up the place. Ever since I moved to Mumbai, I had been hunting for a place that could provide some meaningful solitude in this maximum city. Back home in Delhi, I generally frequent the Full Circle bookstore and Cafe Turtle on weekends. 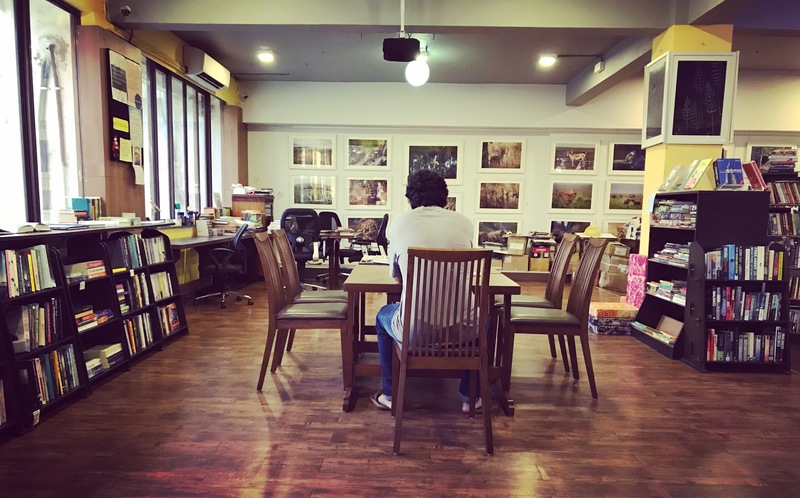 But surprisingly, Trilogy turned out to be a much larger and lesser crowded space, with chairs, cushions, a library and a soulful kind of silence all under one roof! It is just perfect if you’re looking for a cozy afternoon with your favourite read and some soothing music! Located a hop,skip and jump away from the multitude of cafes that Lower Parel has to offer, in case a cup of coffee is on your list! As always, a lovely read and a lovely find. Keep the posts coming!